We bought a new fridge a couple of weeks ago. My old ivory side-by-side fridge was also my travel memory board with magnets from all my various travels in the last 10 years. My fridge always looked cluttered and messy though, which I didn’t like. 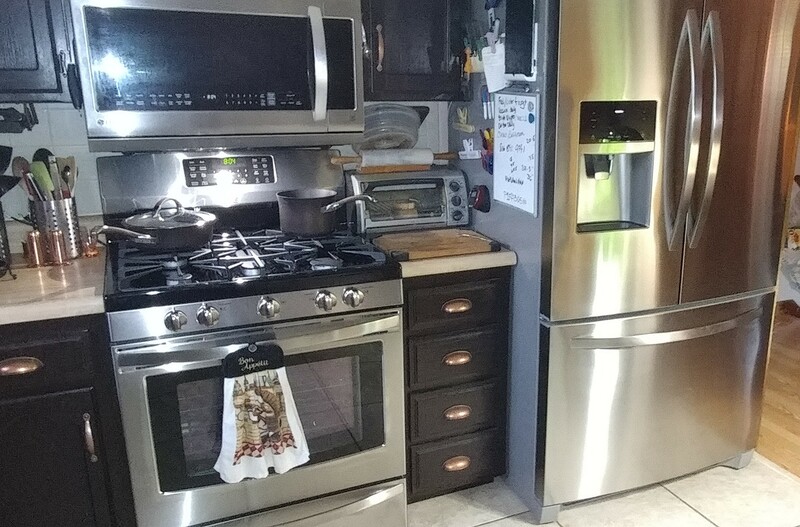 I couldn’t bring myself to clutter the front of my shiny new stainless steel fridge. 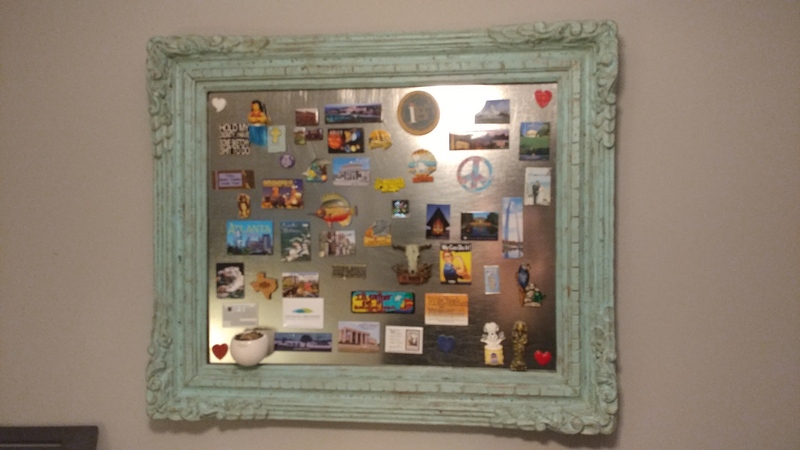 I had thought it would be fun to take an old, ornate frame, antique patina it, and put sheet metal in it to make a magnet board. 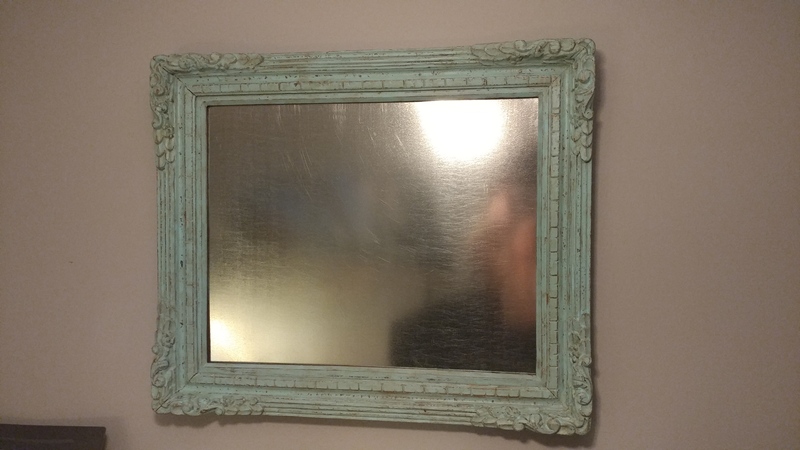 I actually started to do this a year and a half ago when a friend gave me an old frame that was headed to the trash from her garage. I bought the supplies and started to work on the frame last summer. I got sidelined by a rear-end accident last August, that left me with severe whiplash and a lot of pain and headaches. It took several months to pick this project back up, and when I did I could only do a little bit of distressing at a time. In between pain relief procedures, short stints of sanding would leave me with intense headaches, sore and hurting for days. Pressing, and back and forth movement is hard. But I persevered, and here is the finished project. I like how it turned out. I can’t point you to any particular blog or directions. I used information from several different YouTube videos and just kind of winged it. I can tell you what supplies I used, in the order of use. The metal is a sheet of vent flashing from the hardware store. Don’t buy “sheet metal” pieces, that can cost $30-$35 a piece, but go to the HVAC department. I paid $8 for the sheet I used. My husband did the assembly. I really don’t want to do this kind of project again, until I’m pain free, it was too much. I have plenty of supplies though, just in case.